If you dig the peppery, spicy flavor of arugula then you’re going to love this smoothie. 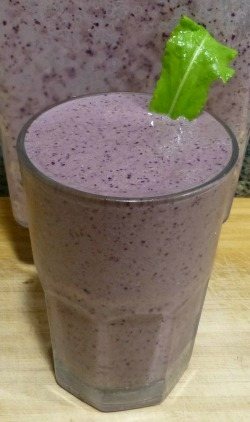 If you’re not a fan of arugula then I suggest finding another healthy smoothie to kick-start your day with. Arugula is one of my favorite greens. I get excited like a kid in a candy store when it’s available through my local CSA. I typically combine arugula with other greens to make a spicy salad mix, and occasionally toss it into my blender to spice up my smoothie. Besides being decidedly delicious, arugula offers some fantastic health benefits. Vitamin Rich: arugula is high in a bevy of vitamins including A, C, and K.
Mineral Rich: arugula also contains a number of minerals including iron, magnesium, and copper. Anti-Cancerous: as with all cruciferous vegetables, the phytochemicals in arugula help prevent many types of cancer. Aphrodisiac: centuries ago the Romans discovered those who ate it on a regular basis were more sexually energized. Who knew? Arugula has a slight cooling effect making it a perfect summer green. Don’t limit yourself to smoothies and salads, try adding arugula to soups, wraps, grains, and make pesto with it. If you love the taste of arugula and eat it straight like I do, use 1 cup and skip the spinach. Enjoy! I’d love to know if you tried this spicy arugula smoothie – please do tell in the comments below. Happy Blending! Not referring specifically to this recipe, but rather, do you have any suggestions on how to doctor up a recipe that isn’t tasting very good? I used the suggestion of equal greens to liquid and 3 x fruit? Are there any fruits, or anything else to try? For smoothies that don’t taste that great I recommend adding additional sweetener (honey, maple syrup, stevia) and/or additional sweet fruit. Cutting back on the not so pleasing ingredients, typically bitter greens, is also advised. Ryan, you were right on, I had some coconut agave and added a little and the smoothie was smooth. Now I can’t remember all I added but I enjoyed it this morning. Thank you.